Throughout the last two years, I have been presenting in numerous different conferences. Now, with JavaOne 2014 just two weeks ahead, I thought it is time to see what I have learned from it as a speaker. Looking at the track record, it appears that during the past years I have managed to speak at exactly fourteen events. This translates to approximately 30 days which I have been away from the Plumbr development – the connections from the tiny Northern-European country Estonia where I live are not among the best ones. Each trip tends to take multiple days, even without the intercontinental flights. Whether this makes me a conference ho or not is up to everyone to decide. For myself I did the math and discovered it to be less than 10% of my total working time during the period, so I am not too worried at the moment. I still recall my very first Java conferences. First one was a small local event, held in 2012 JavaDay Kiev. Even though this was one of the rare cases where I was able to speak in my native language as opposed to the lingua franca of the industry, I still could barely sleep the night before. I went through no less than three practice presentations before stepping up the 200-something audience, which had added a tiny bit of confidence but I still had no idea how this could play out in the larger hall. Looking back at the experience – I now understand why conference organizers are somewhat reluctant to summon unknown speakers. You literally have no way to predict whether they will fall apart during the presentation. The next event was a big one – I was about to present at Devoxx. For those who haven’t heard of it – this is the biggest event for Java held in Europe. 3,000+ attendees should make it second in size worldwide, just after JavaOne itself. I was off the rocky start, as some genius (who happened to be our CEO) thought that it would be a brilliant idea to drive to the event. 2,200 kilometers and six countries apart. In a caravan. Shared with five of us. Don’t be be taken way from the cheering faces in about the picture above. The photo was taken after we have driven exactly three kilometers out of the 2,200. Rest assured, the faces looked a bit different after all this drive. Anyhow, what felt like million hours later I arrived, tired as hell, “well prepared” for my talk the next day. But again, the talk itself, held together with one of our co-founders played out just fine. Even though most of the audience recalled us as “the guys with bow ties and suspenders”, we still shipped vast amount of feedback and insight back from the event. Not to mention the fact that we had a chance to demonstrate our solution to more than 600 people. In addition, now having spoken in JavaOne Russia, 33rd Degree, TopConf, JavaDay Kiev, GeekOut, Joker, JavaOne, Devoxx and Jazoon it is not nearly as scary anymore. But back in the day – you were better off not trying to make a conversation with me 24 hours prior to talk or I would have just have stared at you with an empty look in my eyes. Then became the JavaOne in 2013. The audience was packed. I do not know the count, but based on the room sizes and admitting the fact that even every spot on the ground was filled with people sitting in isles and hallways, I managed to satisfy the high expectations. 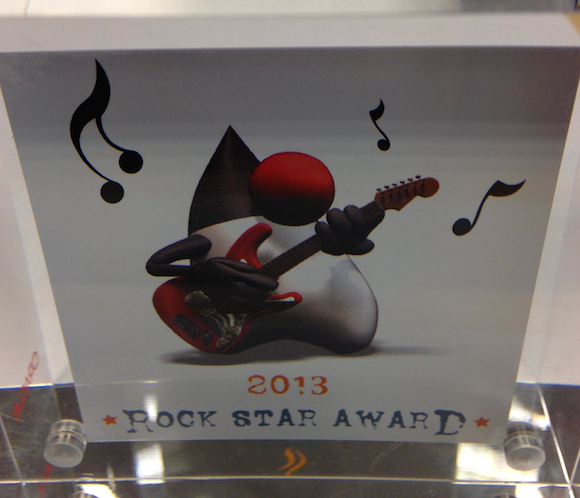 Based on the audience feedback, I was nominated to be among the top 8% of the speakers and awarded a “Java Rock Star” badge. Cannot actually say I felt indifferent about it, perks like this do give the confidence in oneself. Only this year I did my first remote presentation at Melbourne JUG with the talk “I bet you have a memory leak”. Considering the 15,101 kilometers setting us apart, it was the only reasonable way to use the opportunity kindly given by Kon Soulianidis, the local JUG leader. The video of the presentation is now available, so if you have managed to miss my talks, there is now a chance to watch this example about memory leaks online. Considering the positive feedback given to the talk, I now feel inclined to try out more JUG events, so if your local JUG could benefit from a remote talk, drop me a note and lets find a suitable time and subject. When preparing for JavaOne 2014, I was interviewed by the organizers. This was actually one of the reasons I am writing this post. During the interview I started wondering why I am actually going through all this public speaking hassle. Especially when recalling the moment during 2013 where I had three events in less than 10 days. This made me wonder how on earth Venkat Subramaniam or Arun Gupta can keep up with the pace. I was dog tired after this endeavor. Especially when considering that the backlog of our performance monitoring product is huge and I could definitely have spent all this time with developing Plumbr. The upside of doing it is first and foremost about business. Building the knowledge about our product via explaining the underlying problems we solve is something that will eventually pay dividends. Would I recommend a new B2B business to build their marketing solely on conferencing – definitely not. It is both expensive and the outreach is limited. But the trust and connections you build are worth it in the long run. But from a personal standpoint – the crowd I get to meet at those events and the discussions over beer (err, I meant coffee) have also been enlightening. I must admit that several complex problems took a much simpler form after speaking to some of the brightest minds in the industry. Also, standing in front of the large audiences will also help polish the way you articulate your ideas. Anyhow, come to my presentations at Javaone and see if my hands are still shaking. Or join me over a beer for a late night chat.